A lone figure, clad in shorts and gold body paint, stands at the urinal of a dance club. In the distance, a falsetto voice calls out. The figure turns around, his face draped with gold jewelry. As the golden man strides past the bar, through the club’s dance floor, a nastily funky R&B groove develops from a live band. The lone figure climbs a catwalk in front of the stage, before facing off with the source of the vocals: fronting the band is some kind of alien love god, face adorned with even gaudier jewelry, body outfitted with garments for which function is an afterthought: lacey blouse, assless pants, thong. So begins another Tickle Torture show. 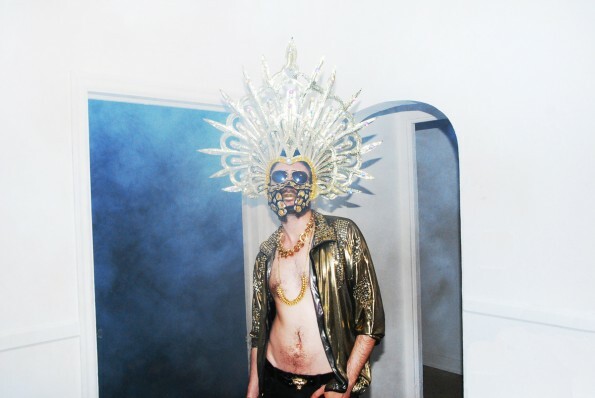 In his human guise, the alien love god is actually Elliott Kozel, the singer, songwriter, and beatmaker behind the disco funk dance music of Tickle Torture. A few years ago, it would’ve been hard to imagine Kozel fronting a project like this. For most of the early 2000s, Kozel was in Wisconsin-based band Sleeping in the Aviary. A far cry from the unleashed id of Tickle Torture, Sleeping in the Aviary released four albums of endearingly clever alt-rock that celebrated and skewered life at the dawn of the 21st century. Loveless vacations, sad housewives, and the feeling of pining for the cute girl at the grocery store while she was hooking up with someone else were all chronicled in punky, poppy bursts of ear candy. After a few brief tours, the band were poised to hit indie rock stardom. And then they didn’t. Once the LP is complete, Kozel’s goal is to shop it around to labels and eventually book a national tour where his band can join him. He’s still putting on Tickle Torture shows, albeit on a smaller scale. He’s played shows accompanied by his phone plugged into a PA system, and it was actually one of these gigs which led to his largest show to date, this August’s Eaux Claires Festival. After more than a decade in the music business, Elliott Kozel has had his share of ups and downs. He’s had to start over more than once, but he’s an artist, and he knows what he was put on this Earth to do. “At this point, I’m definitely still just as driven, if not more driven than ever.” May the odds be ever in his favor. Tickle torture will be appearing on Wednesday, March 16th at the Iron Bear in Austin for SXSW.